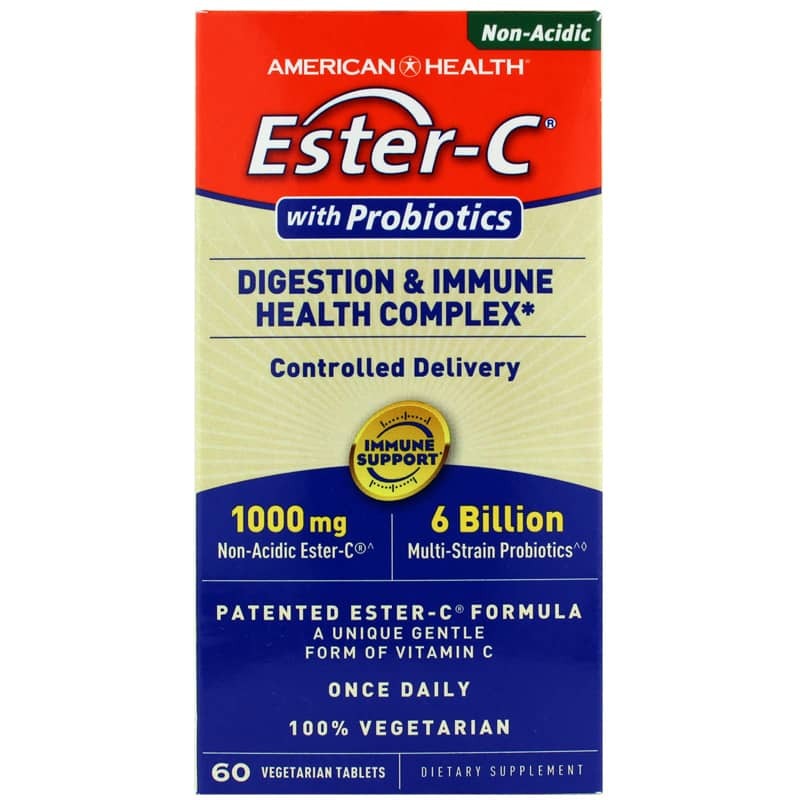 Ester-C with Probiotics from American Health is a dietary supplement that provides a vitamin C and probiotic blend for digestive and immune system support. Ships today if you order in the next 10 hours 6 minutes. 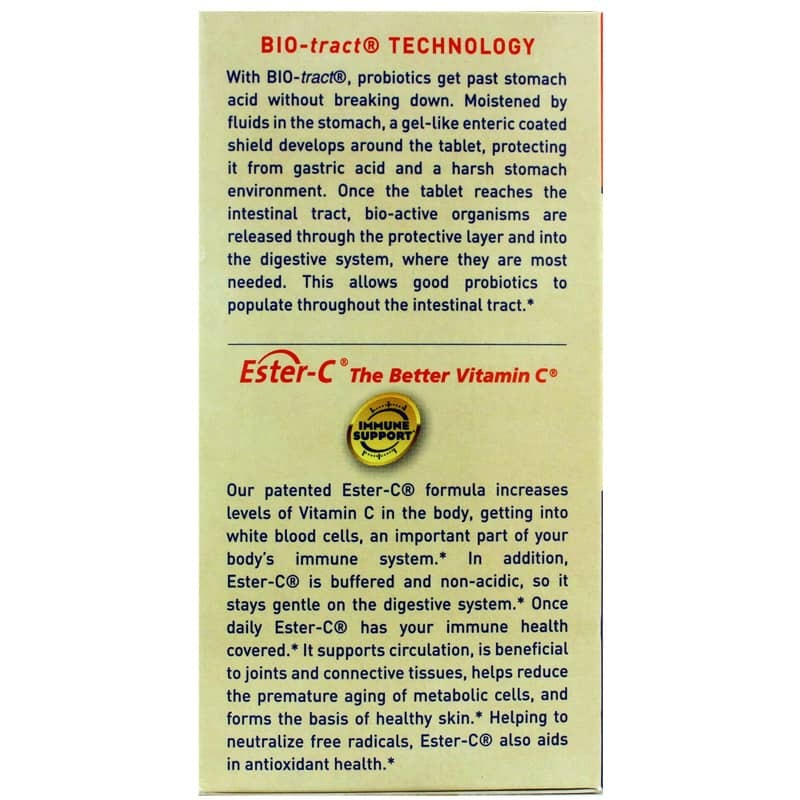 Ester-C with Probiotics from American Health combines patented, non-acidic Ester-C with a multi-strain vegetarian complex of 6 billion bio-active probiotic microorganisms* for digestive and immune system support. This breakthrough formula is enhanced with BIO-tract a controlled delivery technology that protects probiotics from harsh stomach acid, releasing both probiotics and Ester-C throughout the intestinal tract, hour after hour...for the "feel good" difference you can count on. The first line of defense in the body is its immune system, where it fights the damaging effects of free radicals and premature cell aging. Since approximately 70% of immune cells are located in our digestive tract, good intestinal microflora balance is not only important for digestion but plays an important role in reinforcing immune health. With the combination of Ester-Cs 24-hour immune support and 6 billion bio-active probiotics*, you can now experience the advanced level of both immune and digestive support in a once daily complex. With BIO-tract, probiotics get past stomach acid without breaking down. Moistened by fluids in the stomach, a gel-like enteric coated shield develops around the tablet, protecting it from gastric acid and a harsh stomach environment. Once the tablet reaches the intestinal tract, bio-active organisms are released through the protective layer and into the digestive system, where they are most needed. This allows good probiotics to populate throughout the intestinal tract. 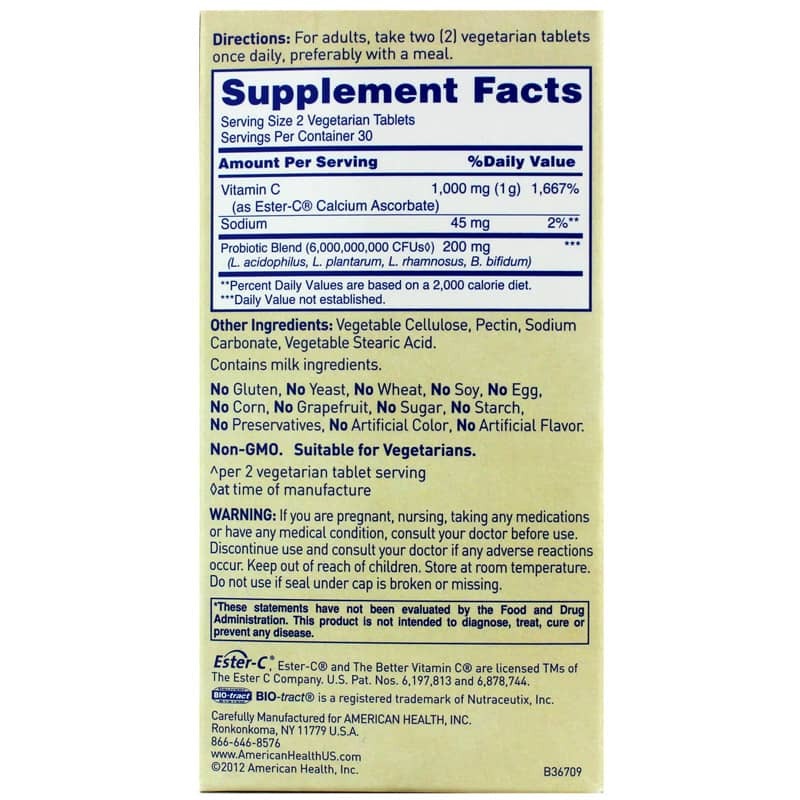 Other Ingredients: vegetable cellulose, pectin, sodium carbonate, vegetable magnesium stearate. Contains NO: gluten, GMOs, yeast, wheat, corn, soy, egg, grapefruit, sugar, preservatives, artificial color, artificial flavor, sodium. Suitable for vegetarians. Adults: Take 2 vegetarian tablets daily, preferably with a meal.